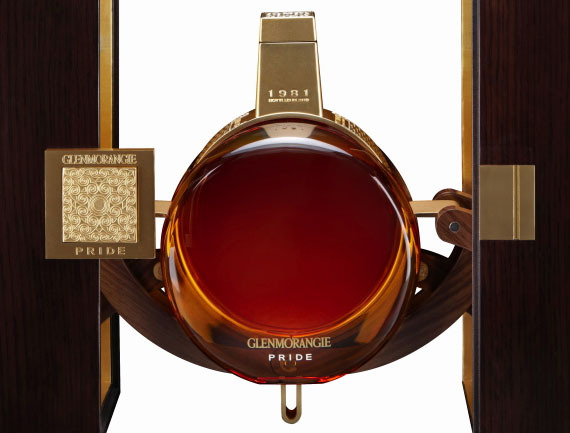 The famed Glenmorangie distillery in the Scottish Highlands has announced the upcoming release of Pride 1981, its most rare and luxurious single malt offering ever. The culmination of 28 years of passion, patience and artistry, the precious whisky was first matured in the finest oak casks for 18 years before being aged exclusively in Chateau d’Yquem Sauternes casks for an additional 10 years. Only 1,000 bottles will be produced and only 100 of those are earmarked for the U.S. priced at $3,600 apiece. Each portion of Glenmorangie Pride 1981 is housed in an exquisite Baccarat crystal decanter designed by renowned artist Laurence Brabant. Each one is individually numbered and personally signed by Glenmorangie Master Distiller Dr. Bill Lumsden. The decanter comes fitted in an elegantly crafted wooden case. We’re told that New York’s haute spirits purveyor Park Avenue Liquor Shop will be getting a shipment of the precious elixir when it’s released in June. Glenmorangie Pride has an intense, deep gold color. Its aromas include apple tart with Demerara sugar and nutmeg underpinned by musky oak tones. The addition of water releases a collection of exotic fruits and spices. On the palate, layers of syrup, sponge pudding covered in milk chocolate, honeydew melon, lemon and vanilla all abound. There is also a backnote of oak tannins with hints of toast and mineral notes. The finish is long, succulent and sweet with hints of Sultanas, toasted almonds, lemon and coconut. Now all you need is a truly special occasion.